Rex Art presents this exceptional selection of artist oil paint brushes & acrylic paint brushes for every application and budget. 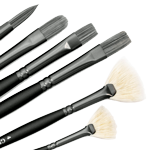 The artist paint brushes in our selection offer a variety of features to suit your needs perfectly. Choose from natural or synthetic bristles, handles of all lengths, and an array of bristle shapes. 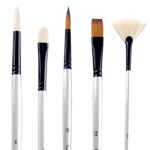 We even have full brush sets, perfect for beginners, students and artists replacing their existing brushes. With the outstanding prices at Rex Art, you can afford to stock up on all the tools you need to create a masterpiece. 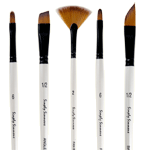 Please review our fine selection of Oil & Acrylic brushes. If there is a brand you are looking for that you do not see please e-mail us, and we would be happy to research it. 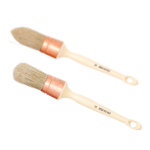 Choosing the best oil and acrylic paint brushes for your needs is extremely important, because your artist paint brushes become an extension of your mind and body. You want to transmit the images from your mind to the canvas flawlessly through your brush, so you should choose acrylic and oil paint brushes made to suit your preferences. Is the handle made from a material that feels comfortable in your hands? Is the length of the handle proportionate to your body? Is the weight of the brush light enough to make quick strokes, but heavy enough to remain steady? 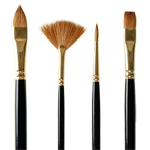 These are all considerations to remember when choosing the proper artist paint brushes. 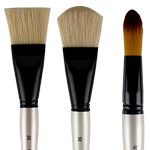 For more information on choosing artist paint brushes, see our Brush Guide.